Explainer: Why was Intel fined? (CNN) -- The European Commission handed down its ruling in a landmark anti-trust case against Intel Wednesday, fining the computer chip giant a record $1.45 billion for abusing its dominant position in the computer processing unit (CPU) market. On Wednesday the European Commission fined Intel a record $1.45 billion for violating anti-trust laws. The ruling, which Intel plans to appeal, may have future implications for American companies accused of "jurisdiction shopping" to avoid anti-trust verdicts against them, says CNN's Jim Boulden, who explains the basics of the Intel case. The commission has hit Intel with the biggest fine ever -- what were its reasons? The European Commission says Intel has been abusing its dominant market position in semiconductors for years. The EC says Intel has systematically given PC makers and stores rebates to keep computers with AMD chips off the shelves. AMD (another American company and Intel's only competitor) first raised the red flag in 2000. Why does the commission have the power to impose such fines? EU law does not regard market dominance as illegal, but it is allowed to fine a company that abuses its position as the biggest in any given market. It has a guideline of fining a company based on a percentage of profits. EU law is set up to "protect consumers," and the anti-trust office says consumers were hurt. Yet as Intel likes to point out, consumers did not launch this case -- AMD, a competitor, launched this in Europe (and in Japan and South Korea) as the U.S. antitrust officials under George W. Bush were unlikely to pursue a case on these merits. The EU could fine Intel (or any company) based on 10% of global annual revenues, but chose to fine it on a smaller percentage made in the EU. Can Intel afford to pay this fine? What state is the company in at the moment? 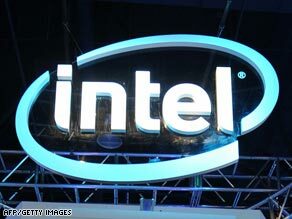 Intel reported first quarter revenue of $7 billion. It can easily afford this. Interestingly, it lost 4 percent of its market share to AMD so far this year. The company says it will appeal -- when is that likely to be heard? Another appeal will take months. Intel already appealed a preliminary part of this ruling last year and lost. Meanwhile, the EC can argue that Intel is still abusing its position and increase the fine during the appeals process, as it did to Microsoft. Intel is not the first tech company to be hit by the European Commission. What about Microsoft? The anti-trust unit has launched another round of investigations against Microsoft. It has already paid its fine and the EU continues to watch the company's behavior on the previous matters. What kind of precedent does the Intel case set? The EU has fined all kinds of cartels and market abusers, but rarely does it fine big American companies based on complaints from American competitors -- so the case catches the eye, especially with critics who accuse American companies of "jurisdiction shopping" to get a favorable outcome.